Lightly oil and heat grill pan or cast iron skillet on medium – high heat. Using a 5cm diameter ring cutter or thin drinking glass, cut watermelon into circles; you should have 20–22 pieces (reserve scraps for another use). Season watermelon on both sides with 1/2 tsp. salt. Grill watermelon until well charred, about 2 minutes per side. Transfer to a plate and set aside until cool to the touch, about 10 minutes. Meanwhile, toss Truss Tomatoes, oil, salt, and 1/2 tsp. pepper in a large bowl. 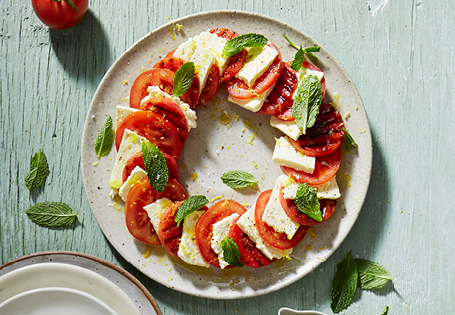 Layer watermelon, truss tomato mixture, and cheese in alternating layers on a platter, draining any extra liquid from Truss Tomatoes before using. Drizzle with oil, season with pepper, and serve.